Soy sauce fried rice seems to be very simple, but it actually takes a bit of technique to pull the full flavors and textures from the ingredients to get the most out of this dish. So today I’m going to explain in this recipe some of the finer points so you can easily create a dish full of color, fragrance, and flavor! The quality of rice is first and foremost. The choice of rice and boiling of rice is very important. It is not good to cook with too much water. Fried rice should use rice with low viscosity. I think Thai rice is very suitable for making fried rice recipes. It is best to use rice that has been able to cool overnight, since the rice overnight will not be sticky. If you don’t like the rice setting overnight, you can cook the rice several hours earlier. Rice will easily stick to a pan, so it is important when frying to pay attention to the amount of oil, it is best to use medium or lower heat first until the rice is separated, then use high heat to stir fry, and to keep the rice moving or to consistently stir to avoid this. You can use cooking oil for fried rice. Lard can be added to enhance the taste, and you can also use green onions. Don’t put too much oil, it will be greasy. Eggs are added if you like, as it will add extra textures and flavors. Fried rice can also be served with meat or vegetables such as ham, bacon, green beans, carrots, etc. for added nutrition and flavors. 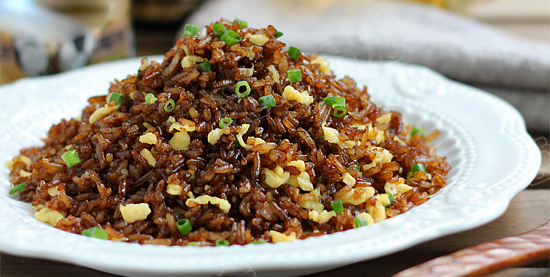 Using a non-stick pan to fry rice, you can put less oil and it is easy to stir-fry the rice. And for those who are watching their fat intake, this will also help. However, I like to use a wok to fry, and I like the thin layer of oil after the frying. If you like a lighter rice, you can use less soy sauce. 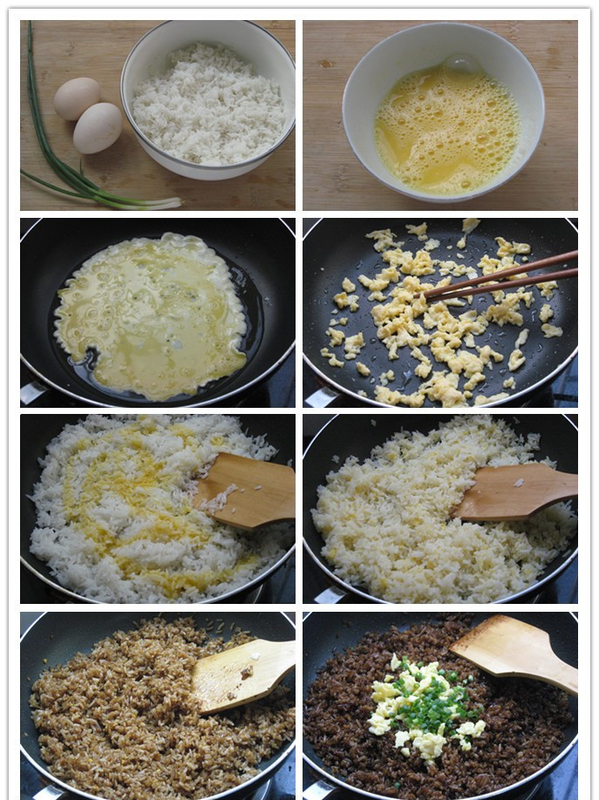 How to stir-fried rice with eggs and soy sauce. Step 1. The egg is beaten in a bowl. Step 2. Heat the wok with a little vegetable oil. After the oil is hot, pour in half of the egg and quickly fry it. Then set the egg aside on a plate for the last step. Step 3. Add the lard and a bit more vegetable oil with the heat on medium. Add white rice with a spatula and stir fry, and pour the remaining egg liquid into the rice and stir evenly to let the egg liquid completely coat the rice. Step 4. After the rice and the other ingredients heated with the moisture mostly evaporated, turn the heat all the way up, pour in the soy sauce and oyster sauce, stir fry quickly. Continue to stir fry for 1 minute, until the rice is loose. Step 5. Turn the heat down to low, add salt, white pepper, the egg from the first step and chopped green onion and stir well. It is now done and ready to enjoy!